This summer Max Brinnich and René Widmann said no to a Fuerteventura trip and were searching for something different, something fresh and new. They ended up in Sri Lanka, the former Cylon, where they found good conditions and lonely spots – so they went for the adventure what they both hoped for! And they got assistance by local Upul De Silva, who runs a center in Kalpitiya and lives in Kaluwamodara. Upul drove the Tuc Tuc and showed them the best spots. An interview and a really well made video will give you an inside view about a country in the Indian Ocean, which recovers from the civil war and offers beautiful beaches with palm trees on the shore, flat water and wave spots and a lot of wind during the European summer and ok conditions during the winter, when the north eastern monsoon is blowing. Perhaps you wanna give Sri Lanka a try in the future. Not without any reason surfing enthusiasts habe been traveling the country since the seventies to follow their dreams. Continentseven: When did you produce the clip and how long did you stay on Sri Lanka? Max Brinnich: We stayed during the summer months. Most of the lifestyle shots we produced during our whole trip, but we did a small mistake with the windsurfing part. We thought it’s a lot of time and we filmed everything in the end – but as it sometimes happens the conditions changed in the end and always when we took the camera out the wind died or dropped. Continentseven: At which spots did you sail and how many days of wind did you get in total? Max Brinnich: We tried to sail the whole variety of conditions Sri Lanka offers. Different lagoons on the north western coast of the big island, a spot which is pretty much like Camocin in Brazil and we tried to score some waves at Arugam Bay, a famous break on the east coast of Sri Lanka. The Wind was good, especially during the first 5 weeks. We never really had to think, if there will be wind tomorrow. But then the weather system got killed by a tropical storm – so we had around 10 days of no wind in a row. 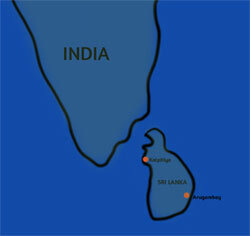 Continentseven: What’s the best gear for Sri Lanka? Max Brinnich: It depends. For the summer months I pretty much used 4.2 and 4.8 all the time with my 90l Freestyle board. But I heard it’s a bit lighter during the winter. 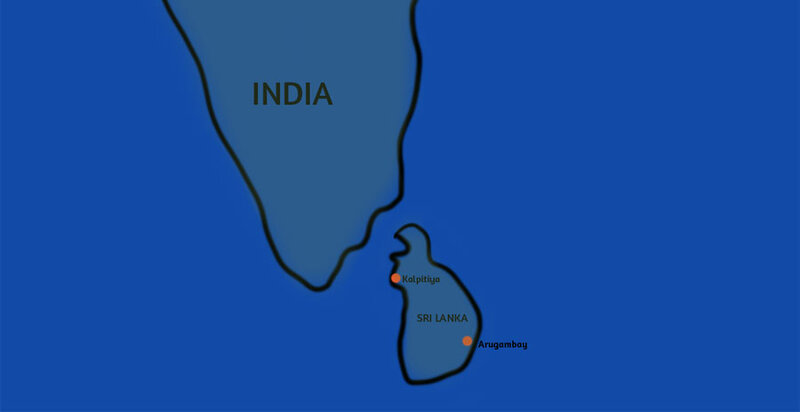 Max Brinnich: There is one Windsurfcenter “Desilva Windresort” on the Kalpitiya Lagoon. There you can at least borrow pretty new equipment from Gaastra/Tabou. Upul De Silva, the owner also wants to start a small shop this year. But beside that it’s super hard to buy a fin or a base, so better prepare yourself really well! Continentseven: How much gear did you bring? Max Brinnich: I travelled with two bags: 4 masts (2x 370, 2x 400), 2 booms, 4 sails (4,2; 4,5; 4,8; 5,2), a lot of small stuff and just one board, because the airline didn’t want to take my wave board. But if I would go now, I will just bring 4,2 and 4,8. Continentseven: Would you travel there again? Max Brinnich: Yes 100%, because the complete package is insane. Lonely spots – with a huge variety of conditions, nice people and amazing food. Continentseven: What’s your favourite food over there? Max Brinnich: Curry and all the fruits. Continentseven: How did you communicate with the people there? Max Brinnich: This was pretty easy. A lot of people speak English because of their background as a English colony. And if they didn’t speak English we found always other ways to communicate. The people are really really friendly there! Continentseven: Many companies produce their sails over there. Are there any local windsurfer? Max Brinnich: I heard that there are some windsurfers, but I just saw one. Continentseven: What impressed you most in Sri Lanka? Max Brinnich: After the civil war (which just ended 2009) and the Tsunami (in 2004) there is so much spirit of optimism. And you can really feel the positive vibes. For me the best point was: we arrived as white tourists and left as friends from quite a few local people. They even invited us in their homes for dinner. So we made a lot of cultural experiences, which you normally will not get. Max Brinnich: What I want to add. We probably don’t show the best windsurfing action ever, and I really wanted to show more – but because of different reason we couldn’t get it on tape. Anyways we had a super positive time there and I want to share the vibes of my trip with you – I hope you like it anyways!